After barely surviving an overthrow attempt by gangster Gyp Rossetti, Nucky Thompson is laying low at the end of the Boardwalk. However, the calm will be short-lived, as Nucky faces new challenges, including a clash with a violent Harlem power-broker, a battle with his brother Eli over Eli's college-age son, and the irresistible lure of lucrative - and perilous - opportunities in Florida. 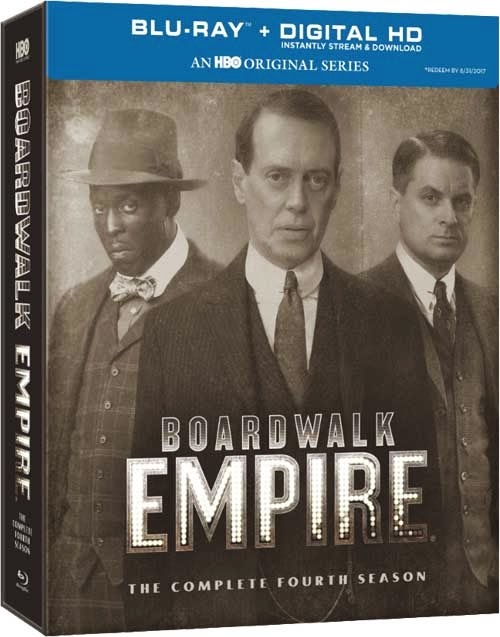 Featuring "achingly good performances," (The Chicago Tribune), Boardwalk Empire: The Complete Fourth Season is jam-packed with exclusive bonus material and is not to be missed! Boardwalk Empire is one of those shows that you can easily get addicted to. That is what happened to me when it first started. Now that the show is ending after season five, I am even more eager to watch every episode again. I held off on watching season four until it was available on Blu--ray and when I received it, I couldn’t wait to start it. Unfortunately, the way my schedule worked out, I had to wait a little while. And every day, I saw it sitting on the TV stand calling for me to watch. When I finally had the chance, I, like with every episode, kept watching and couldn’t stop. I had to pace myself and break it up, otherwise, I would have been up for 12 hours straight and would not have been able to function at work the next day. The acting is spectacular and every actor embodies the character he or she portrays. 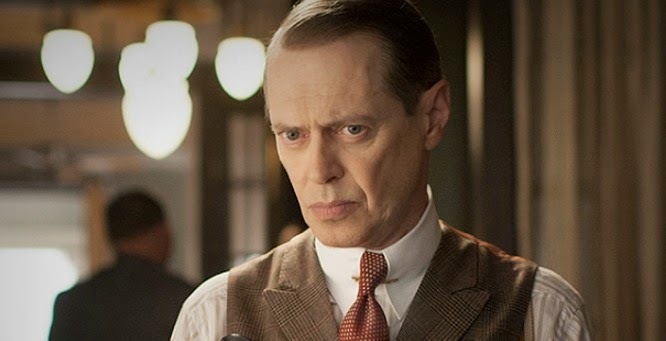 Steve Buscemi is a perfect Nucky Thompson, the head of the Atlantic City mob. Michael Shannon is great as Van Alden, though I wish he wasn’t so weird. I find myself annoyed with him, but it really shows how he’s changed from the straight-laced Prohibition Agent he once was. I really like watching everyone on screen, and watching the special features and hearing the commentary over the episodes was really enlightening. New York Sour – Nucky is back brokering deals between himself, Rothstein and Masseria. He’s staying in a hotel room, alone, thinking solitude is best. There’s a new prohibition agent in Atlantic City and he’s not as innocent as everyone seems to think he is. Gillian tries getting Tommy back, but is still an addict and prostitute. Richard has resorted to old tactics while travelling to see his sister. Chalky has opened the Onyx Club on the Boardwalk, and his partner gets into some to some trouble with an entertainment manager and his wife. In Chicago, Al Capone is trying to assert his influence. Resignation – Van Alden, now working for O’Banion, provides some muscle and delivers flowers, and is then assigned to “assist” Al Capone and is drawn into election issues in Cisero. Nucky, is dealing with a new, young Prohibition Agent, trying to expand his business and trying to help Chalky with issues at The Onyx Club. 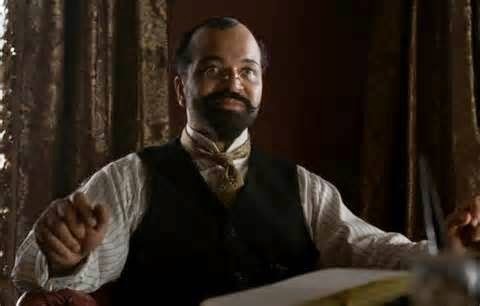 Chalky is still trying to find the entertainment manager’s wife, and when she shows up with a man advocating for her, Valentin Narcisse, he rebuffs her claims. Chalky must reconsider and allows the Narcisse to become a partner in the business when he prevents Chalky’s club band and dancers from working. Harrow has returned home and is with his sister handling issues at the farm. Meanwhile, a young J. Edgar Hoover arrives on the scene and is investigating the goings on in Atlantic City. Acres of Diamonds – Nucky is in Tampa, Florida, visiting an old friend when he overhears a young man selling swampland under the premise of a soon to be resort. Narcisse meets with Rothstein and makes a deal with him to buy heroin. He then begins taking advantage of his partnership with Chalky and convinces him to allow a young singer to perform in the club for a week. Harrow gets into some trouble at the farm and is helped by his sister. Eli’s college-aged son, Willy, tries to obtain booze from Mickey for a party at his college. All In – Nucky proposes a partnership with Rothstein, but after Rothsteain loses big at the poker table, Nucky partners with Meyer Lansky instead. Val Alden realizes Frank and Al Capone are worse than O’Banion. And after Nucky trusts him with a delivery, Eddie gets into trouble with Ralph Capone and caught by Prohibition Agent Knox. Chalky’s partner Dunn goes to Narcisse, where he’s recruited into his group. Willy plays a prank against a rival at school and it goes horribly wrong. 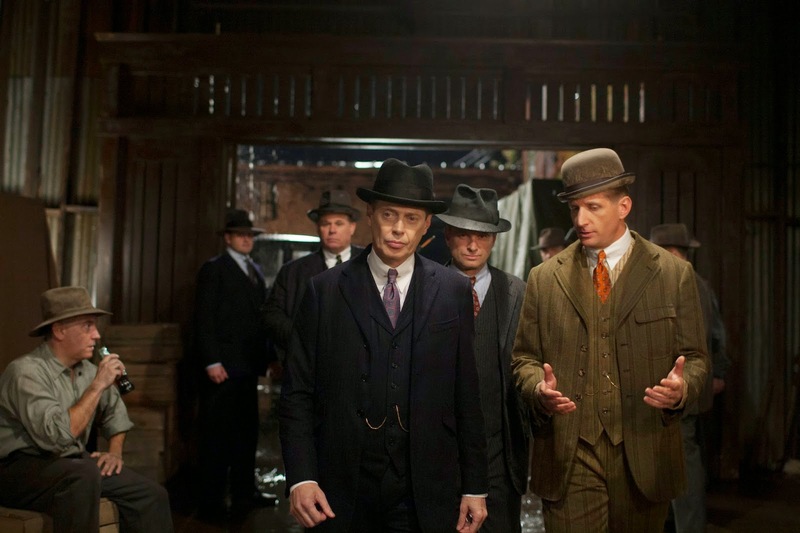 Erlkonig – As Eddie is questioned by Agent Knox, Nucky heads to Philadelphia to help his nephew Willy, who has been arrested in connection to the death of his rival. Nucky gets the whole story from Willy, who then gives the district attorney a false alibi and the DA receives a payoff from Nucky. Van Alden is helping Al and Frank Capone rig the election in Cisero, to deadly consequences. After being released by Knox, Eddie returns to Nucky’s rooms and suffering from the guilt of talking to Knox, commits suicide. Gillian tries getting Tommy back and runs into a bit of trouble and is rebuffed. The North Star -- Nucky, back in Florida, is handling business with Lucky and Lansky. He grows closer to bar owner, Sally, and begins more than a business relationship with her. Richard returns to Atlantic City and runs into his friend Paul before going to Julia’s to see Tommy. Julia and Richard talk and Julia tells Richard what she needs. Knox, undercover again as a Prohibition Agent visits Mickey and Eli, but can’t escape the guilt of what happened to Eddie. Eli asks Knox for a favor and gets him to use is badge to access Eddie’s safe deposit box. William Wilson – Al Capone begins a rampage against the Chicago Police as revenge for his brother’s death. Convinced O’Banion had something to do with it, he goes to Torrio who tells him to leave it alone. However, after Torrio and O’Banion are arrested shortly after closing a real estate deal, Torrio gives Al the okay to go after O’Banion. Succumbing to his guilt over the death and subsequent framing of his roommate, Willy drops out of school angering Eli. Gillian tries to kick her heroin habit by going cold turkey and with the help of Roy, makes progress. J. Edgar Hoover is sworn in as head of the Bureau of Investigation, and Knox, whose real identity is James Tolliver, makes a mistake which leads to suspicions by Nucky. After growing closer to her, Chalky learns the reason as to why Daughter Maitland is beholden to Narcisse. Narcisse, meanwhile tries to alleviate some of the issues with the bad heroin Dunn is distributing and keep his side business booming. The Old Ship of Zion – Chalky figures out Narcisse is responsible for the drugs in the neighborhood and sends him a message by breaking up the drug house. Narcisse responds by hiring Dunn to kill Chalky, but before he can do that, Daughter Maitland steps in. The first shipment from Florida arrives in Atlantic City, and along with it, Sally. Willy drops out of college and asks Nucky for a job. Tolliver figures out that Nucky had something to do with Willy’s release in Philadelphia and approaches Eli trying to get information. Marriage and Hunting – In Chicago, Val Alden, feeling pressured by his wife, O’Banion and Al Capone, is accosted by his former coworkers at the iron company. He’s had enough and during the struggle, kills the men. This changes his whole outlook on everything and after agreeing to kill O’Banion, he confesses his true identity to him. Chalky vows revenge on Narcisse, who has beaten Daughter Maitland until she is unrecognizable. Richard comes to Nucky asking for a job, telling him that he and Julia were just married. Jillian goes to court trying to get Tommy back. White Horse Pike – Al decides to begin allowing Val Alden to run his pick ups and gives him part of the territory. Chalky goes after Narcisse and misses. He goes into hiding and Nucky arranges for him and Daughter Maitland to be moved. Willy goes to Nucky and reports that the mayor is in the pocket of Narcisse and Chalky is in danger. Nucky receives a phone call from Sally who tells him that Lucky and Lansky are moving heroin along with the booze from Tampa. Eli checks it out and finds the rumor is true. Margaret receives an offer from Rothstein and after considering it, makes a counter offer. Havre de Grace – Chalky and Daughter arrive at the home of his mentor, Oscar. There, they find shelter and protection. Chalky decides that he is going to leave his family and he and Daughter will run away, hide and begin a new life together. However, before they can do that, Daughter leaves and Chalky is caught in a shoot out in the middle of the night. Jillian visits Tommy and sees that he has a good life with Julia and Richard. She and Roy decide to run away to California and after Roy commits a murder, she confesses to the murder of Roger, the boy she killed and pretended was Jimmy. After having dinner with Eli and his family, Nucky decides he wants out of the Florida deal. Farewell Daddy Blues – Chalky approaches Nucky and tells him he wants the war between him and Narcisse to end. Nucky sets up a sit down between the two at The Onyx Club, but has ulterior motives. What Chalky doesn’t know is that Narcisse has Chalky’s daughter, Maybelle and uses her as leverage. Gillian has her day in court and in order to ensure a conviction, Richard asks Nucky to produce Jimmy’s body. 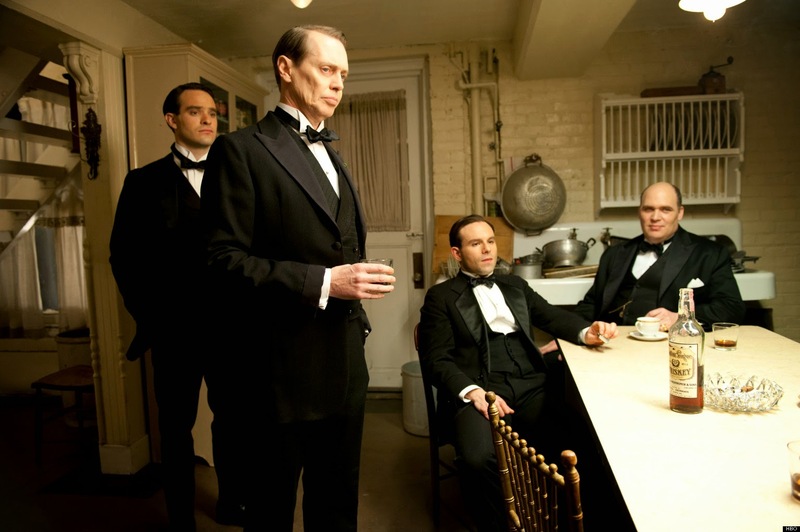 In return, Nucky hires Richard as a hit man and orders him to kill Narcisse. 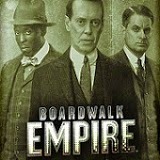 Eli’s deal with Tolliver falls through when Nucky finds out the truth. Tolliver confronts Eli at his home and they fight. To protect him, Nucky sends Eli to Chicago where he is met by Van Alden. In Chicago, Torrio is shot and as a result, entrusts his entire operation over to Al. The widescreen presentation of Boardwalk Empire Season Four is very, very good. The picture was clear, rain drops were sharp and the viewer can see every one. Colors were good and skin tones were accurate. Black tones were sharp and didn’t overtake the rest of the scenes. This is a great show to watch on television and it’s even better on Blu-ray. As with season three, at times the sound was a little uneven – gunshots and background music were at a higher volume than the rest of the episode, and additionally, there were parts where the dialogue was really soft and I had to turn the volume way up just to hear what was being said. Other than those minor issues, the English DST HD MA 5.1 was very good. The season is also available in French DTS-HD MA 5.1, Spanish DTS Digital Surround 2.0, and Castillian DTS Digital Surround 5. As for subtitles, they are available in English SDH, French, Spanish, Castillian, Dutch, Danish, Finnish, Norwegian, and Swedish. As always, HBO’s Blu-ray set is full of special features. HBO has some of the most robust special features sections I’ve ever come across. All the features are interesting and relevant and I really enjoy them. In this set, as with season three, the Boardwalk Chronicle features were my favorite. They gave background on the people, places and things in the episode and really gave good background. I also enjoyed the commentaries, as they gave good perspective on the episodes. I always look forward to the special features on HBO Blu-ray sets, knowing I will enjoy watching them. Play with Boardwalk Chronicle – Like in seasons before, this on screen guide replays the episode with updates throughout. “Characters” tells you which characters are in the scene, “Location” tells you where the scene takes place, “Facts” gives you the history of the people and events that inspired the show, and “Scouting the Boardwalk” is a video featurette that shows you how the location manager finds the buildings and areas of 1920s Atlantic City. By far, this is my favorite of all the features. Play with Commentary – This replays the episode with commentary from Tim Van Patten and Steve Buscemi. Season Three Recap – The “previously on” part of the episode, which recaps the entire third season. Preview – The preview of the episode. Play with Commentary – A replay of the episode with commentary from executive producer/writer Howard Korder, Erik LaRoy Harvey (Dunn), Michael Kenneth Williams (Chalky) and Margot Bingham (Daughter Maitland). Season 3: Revisited – Get reacquainted with season 3 of Boardwalk Empire with the 14-minute recap featuring creator/executive producer/writer Terence Winter. This was a good recap, which helped me remember what happened in season three. PaleyFest: Made in NY Boardwalk Empire Panel – A Q&A with creator/producer/writer Terence Winter, executive producer/writer Howard Korder and cast members of Boardwalk Empire after a screening of episode five, “Erlkonig” – courtesy of the Paley Center for Media. 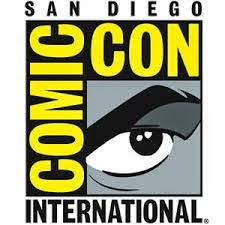 It was interesting and I enjoyed hearing the thoughts of the cast and producers/writers. The Onyx Club: A Step Back in Time – An exclusive behind-the-scenes look at the creation of, and historical inspiration for the massive new set in Season 4 – The Onyx Club. Set designers, cast and crew talks about the club and what true location it was based upon. After watching this feature, I wish there were clubs (minus the obvious racism) like that in existence today. It seems amazing. Becoming Harrow – In an exclusive set of interviews, actor Jack Huston details the origins, story arc, and evaluation of fan-favorite character Richard Harrow. I really enjoyed watching this feature. It told the story of Richard Harrow, how he came about and actor Jack Huston talked about how he created the character. Richard is one of my favorite characters and seeing how he came about really brought him to life. New Characters – Meet the new characters introduced in season four: Dr. Valentin Narcisse, Roy Phillips, Warren Knox/James Tolliver, Sally Wheet, Frank and Ralph Capone and Daughter Maitland. A background on each of the new main supporting characters. I liked watching this as it gave more insight into the characters. Scouting the Boardwalk – Hear how the locations manager of Boardwalk Empire finds the unique buildings and neighborhoods that bring the 1920s to life in each episode. This feature is part of each Boardwalk Chronicle feature for each episode. When this separate feature is chosen, the viewer can watch individually or in a play all option. Boardwalk Empire is a great show. Season four is no different. Characters are introduced, killed, blackmailed, alliances change and still the stories flow smoothly. With the final season beginning in just a few days, I’m counting the days until I get to see what happens to Nucky Thompson and his crew and his partners in Atlantic City, New York, and Chicago. Throughout the series, Al Capone has, hands down been my favorite character. The doesn’t change in season four. Season five, I expect, will have some major story lines as it will be the final season. I do not look forward to saying goodbye to some of my favorite characters, but do look forward to seeing how the story plays out.